This week we have a separate section covering the debate over the legality of jailbreaking the iPhone. iPhone Jailbreaking Soon to Be Legal? "Here are 10 tricks that can open up your iPhone's potential. Send free SMS messages, or "fake" MMS messages. Sync your iPhone's calendar with Google Calendar. "Thanks to a suggestion from Macworld reader David Erato, I've spent the last couple of weeks immersed in spreadsheet applications . . . no, not on my Mac, but on my iPhone. David was curious how well the available iPhone spreadsheet applications worked, and whether or not any of them were worth their cost. "With some help from David and some digging around in the App Store, I found five programs that all allow you to not just view, but also to edit and create, spreadsheets directly on your iPhone. So how well can a device with limited screen size and without a mouse or physical keyboard work for editing and creating spreadsheets? In many ways, better than I would have expected . . . as long as you realize the limitations going in and don't set your sights too high...."
"This adds a new level of mobile interaction for iPhone users. For example, users could better keep their budgets but adding expenses during the day. It can also serve as a great way to extend collaboration away from the desktop, such as in meetings or on the road...."
"I travel a lot. And if you're a geek like me, you can't go a full day sans internet access without experiencing some severe withdrawal symptoms. Luckily, my iPhone, with all its WiFi and 3G goodness, has been instrumental in feeding my addiction while on the road. But though Apple's smartphone provides the best mobile browsing experience out there, the small screen and touch controls still don't compare to the pixel real estate and tactile qwerty speed of a laptop. Not to mention such luxuries as Flash compatibility, page caching, and tabbed browsing...."
"Hands-on Apple's Apple TV set-top box supports all the audio and vidio [sic] file formats that iTunes, iPods and iPhones can handle. That's plenty for many folk, but for those who favour less mainstream formats or widespread ones that Apple's not keen on - DivX, for one - it severely limits the value of the machine. "Fortunately, once the Apple TV's sealed system has been opened for access - as we detailed last time - it's surprisingly easy to increase the number of codecs the machine has access to...."
"In some ways, the iPhone is more like a palmtop computer than a cellular phone. As with many smartphones, you can use it to make and receive calls, watch movies, listen to music, browse the Web, and send and receive e-mail and text messages. You can also take pictures with a built-in camera, import photos from your computer and organize them all using the iPhone's software...."
"Jailbreaking an iPhone constitutes copyright infringement and a DMCA violation, says Apple in comments filed with the Copyright Office as part of the 2009 DMCA triennial rulemaking. This marks the first formal public statement by Apple about its legal stance on iPhone jailbreaking. "Apple's iPhone, now the best-selling cellular phone in the US, has been designed with restrictions that prevent owners from running applications obtained from sources other than Apple's own iTunes App Store. 'Jailbreaking' is the term used for removing these restrictions, thereby liberating your phone from Apple's software 'jail.' Estimates put the number of iPhone owners who have jailbroken their phones in the hundreds of thousands. "As part of the 2009 DMCA rulemaking, EFF has asked the Copyright Office to recognize an exemption to the DMCA to permit jailbreaking in order to allow iPhone owners to use their phones with applications that are not available from Apple's store (e.g., turn-by-turn directions, using the iPhone camera for video, laptop tethering)...."
"The Electronic Frontier Foundation has filed requests with the US Copyright Office to exempt activities from legal threats under the DMCA, one of which attacks Apple's secured software business model on the iPhone. "Apple responded with claims that the EFF's exemption would only stifle innovation, not promote it, and claims that allowing users to jailbreak the iPhone would really only result in damage to the phone, its software market, and users' experience...."
"Here's some interesting news that could affect the continued growth and success of Apple's App Store. "The Electronic Frontier Foundation has proposed to the Copyright Office that the iPhone be exempt from the Digital Millennium Copyright Act thus deeming it legal to jailbreak its software. Apple, for their part, says that by allowing such a proposal to take effect, it will 'destroy the technological protection of Apple's key copyrighted computer programs in the iPhone device itself and of copyrighted content owned by Apple that plays on the iPhone.' The EFF, on the other hand, believes that by allowing jailbreaking more innovation can take place and more apps will be developed." Link: iPhone Jailbreaking Soon to Be Legal? "After all, who wants to do business with a company that combats with its own customers in court? "I'm wondering if Apple may find itself seen in that same category...."
"Skype and Mozilla have thrown their weight behind the Electronic Frontier Foundation (EFF) in that digital-freedom organization's fight to loosen the Digital Millenium Copyright Act's (DMCA) restrictions on iPhone jailbreaking. "In separate filings with the US Copyright Office, VoIP-master Skype and Firefox publisher Mozilla argue that the DMCA should be amended to allow mobile-phone users the freedom to modify their handsets to allow access to third-party applications and services not approved by the handsets' manufacturer or carrier. "While Apple's iPhone is mentioned only once in Skype's filing (PDF) and not at all in Mozilla's (PDF), that überpopular smartphone is ground zero in this digital dust-up...."
PR: Yahoo! 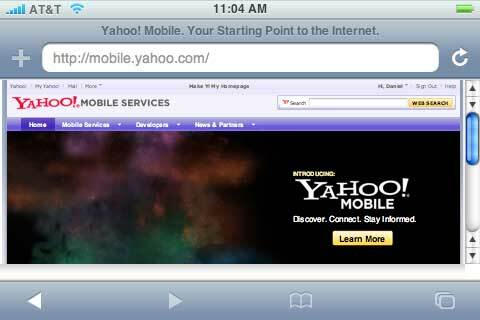 has announced the upcoming launch of its new Yahoo! Mobile service - a highly personalized mobile starting point to the Internet. Yahoo! Mobile will be available on the mobile Web, as an app developed for the Apple iPhone, and as an app developed for smartphones from Nokia, RIM, Samsung, Sony Ericsson and Motorola as well as those powered by Windows Mobile. Yahoo! Mobile initially will be available today through a managed beta program, with general availability expected in Q2 2009. The Yahoo! Mobile home page. Discover: via results from Yahoo! 's award-winning mobile search, editor-selected content, and new maps tools. Stay Connected: through access to their email and social network accounts from the most popular Web providers, as well as instant messaging, address book and calendar tools. Stay Informed: by bringing together favorite content - websites, sports teams, news sources, RSS feeds, weather, stocks, horoscopes and more - into a single location. Yahoo! oneSearch - Yahoo! 's award-winning mobile search service providing the most current, relevant answers you need. Email - Access to Yahoo! Mail and other popular email service providers, including Gmail, Windows Live Hotmail and AOL Mail. Pulse - Access to their social networks, including Bebo, Dopplr, Facebook, Flickr, Friendster, Last.fm, MySpace, Twitter and YouTube. Yahoo! onePlace - Access and manage your favorite content, all from one location. Its "Add Anything" functionality is a simple-to-use search and browse process that helps users find and add what they want. Consumers can add their favorite interests from a growing selection of popular categories including news topics and sources, RSS feeds, weather conditions, sports scores, stock quotes, websites/blogs, horoscopes and movie theaters. Yahoo! oneSearch with Voice - Allowing users to launch searches by simply speaking. Opera Mini 4.2 - An integrated version of the world's most popular mobile web browser, with easy return to the Yahoo! Mobile app, that launches when web site access is needed. Devices: hundreds of select models from RIM, Windows Mobile, Nokia S60 and 40, Samsung, Sony Ericsson and Motorola. "Here's an ingenious iPhone app that would have no problem being approved instantly by Congress. It's the first true economic stimulus package created for the iPhone. Kids Eat Free ($.99) pays for itself after only one use. Families will finally have an alternative to fried Spam sandwiches." PR: Random Ideas, LLC, has announced the release of an update to its popular iZen Garden for the Apple iPhone and iPod touch. iZen Garden Version 1.7 is available for download for just $2.99 from Apple's App Store and can be purchased through iTunes, or through the App Store directly on the device itself. 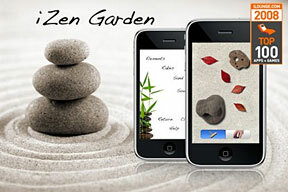 iZen Garden is available in all 62 countries that the App Store services. 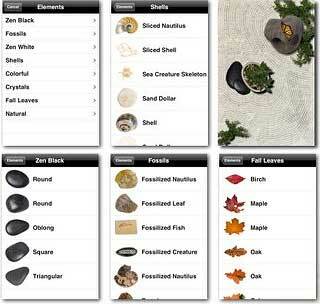 iZen Garden is only $2.99 and available exclusively through Apple's App Store. For art assets, press materials, or review copies please visit the Random Ideas website contact us via email. Microsoft My Phone synchs information on your mobile phone to a storage space on a web site hosted by Microsoft. If your phone is lost or stolen, or if you upgrade to a new phone, you can easily restore the contacts, calendar appointments, photos, and other information that you stored on My Phone to a compatible new or replacement phone. Most phones that run the Windows Mobile 6 operating system are compatible with My Phone service. Microsoft My Phone enables you to view and manage phone information by using a web browser. In your web account, you can add, edit, and delete contacts and calendar appointments, and the changes will appear on your phone the next time that you sync. Microsoft My Phone makes it easy to view photos on your computer that were taken with your camera phone. From your web account, you can save photos to your computer or can e-mail them to family and friends. Microsoft does not charge a fee for the My Phone service at this time. But the data plan you have with your mobile operator may require you to pay data-transfer charges when you use the service. If you are unsure of your plan coverage, please contact your mobile operator. The first time that you run the My Phone application on your mobile phone, you will be asked to accept or change the recommended settings. Recommended settings will synchronize contacts, calendar appointments, tasks, photos, videos, text messages, music, and documents between your phone and your My Phone web account. TVEyes Mobile for Apple iPhone enables search for TV and radio broadcasts, real-time email notification of content that matches keywords of interest, and immediate playback of clips on the iPhone. TVEyes is the first and only media monitoring company to provide this capability. "TVEyes Mobile provides our full TV and radio search, and real-time alert capabilities on the iPhone, an ideal platform on which to inaugurate our mobile initiative," said David Ives, CEO and founder of TVEyes, Inc. "Business, government and political users must be able to respond within the current day's news cycle regardless of where they are, in the US or abroad, and TVEyes Mobile uniquely addresses that requirement." TVEyes Mobile provides the same search and alert capability for US and international broadcast television and radio as TVEyes Media Monitoring Suite for the desktop. Uniquely among media monitoring companies, TVEyes delivers video in the format required for video playback on the iPhone (H.264 or MPEG-4 Part 10). The service is available immediately, and at no additional cost, to subscribers of the company's Media Monitoring Suite. TVEyes Media Monitoring Suite offers real-time tracking and historical search of US and international broadcast television and radio via its continuously updated database. Users are alerted and can search topics based on a Spoken Word Index that retrieves television and radio clips and presents them for viewing in a Web-based environment. These clips can be saved in files and/or e-mailed as well as downloaded. Users can search the database and be alerted against keywords in English, Spanish, Chinese and Arabic - with real-time language translation. TVEyes Inc., headquartered in Fairfield, Conn., provides online, real-time spoken word search and indexing for television and radio broadcasts, audio and video search infrastructure for search engines and broadcast production, and advertising solutions for video and audio publishing Web sites. Its Media Monitoring Suite is in use by corporations, professional sports teams, political campaigns, elected officials and the military to provide up-to-the-second intelligence on broadcast news, in multiple languages for US and international markets. PR: Hey Mac Software has announced that the second major update to its popular Briefcase and Briefcase Lite for iPhone software is now available at the App Store. The full version of Briefcase has been optimized to provide improved overall performance, better handling of data-heavy file transfers, and faster start up. Moreover, core changes to the networking component of Briefcase result in improved remote login and make the software more compatible with Linux and SSH distributions available for Windows. Other enhancements new to Briefcase 1.2 include support in the viewer for RTF, RTFD, and OpenOffice ODT files transferred from a Mac, as well for syntax highlighting of source files for the majority of industry-standard programming languages. Briefcase Lite users will also benefit from the performance improvements developed for this update. Both versions of the software have also undergone a number of bug fixes and include improved error reporting that will help first time users get started with Briefcase. Briefcase gives Mac users a much simpler, iPhone-centric workflow than other file transfer apps. As such, it requires no cables, no client software, no switching back and forth between the iPhone and Mac, and no typing of an IP address. Briefcase is priced at $4.99 and is available in 10 languages. The software can also be used to transfer files from Linux and Windows systems to the iPhone provided those systems are running SSH. Briefcase Lite is a free version of the software that gives users access to all of the most common features and functionality of Briefcase. PR: The Big Stone Phone company has released MobileMix, their pocket music studio for iPhone and iPod touch. MobileMix brings beatboxing to the iPhone. 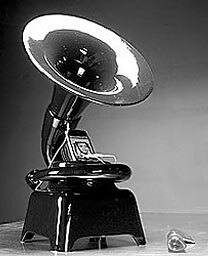 Record and loop as many tracks as you want - and make as many songs as you like too! Upload tracks and album art to your desktop. MobileMix lets you record individual tracks and play them all back at the same time, creating a grand orchestra from just a single voice. Or pass it around and let friends each layer a track. Big Stone Phone company has released its innovative new application for iPhone and iPod touch 2 named "MobileMix" - the portable pocket music studio. MobileMix brings beatboxing to the iPhone. A loop machine of sorts, MobileMix lets you record individual tracks and play them all back at the same time, creating a grand orchestra from just a single voice. Or pass it around and let friends each layer a track. "Are you ready to become a first-class hip-hop artist? ", inquired Stone's CEO and Chief Computer Scientist Andrew Stone. "With MobileMix you can instantly create new songs. Capture ambient sounds and overlay with your own poetry, singing or raving. Lay down music tracks and you are a one [wo]man band!" If you have a Mac, you can drop the uploaded tracks onto Stone's Videator and watch a live movie with your song's tracks. For more information on Videator, visit their website. MobileMix was created by Geoff Pado of CocoaType and Big Stone Phone's Andrew Stone. PR: Brad Brooks has released EditCalc, an iPhone/iPod touch calculator for film, video and audio professionals. EditCalc handles frame, footage and timecode calculations and conversions with simultaneous display of all units. Users can switch between frame rates, drop frame/non-drop frame or film types with the press of a button and any previous calculation value or result can be recalled from the history view with a touch. Brad Brooks has released EditCalc, an iPhone/iPod touch calculator for film, video and audio professionals. EditCalc handles frame, footage and timecode calculations and conversions with simultaneous display of all units. Users can switch between frame rates, drop frame/non-drop frame or film types with the press of a button and any previous calculation value or result can be recalled from the history view with a touch. The calculator interface has been streamlined so that users need not enter separators for timecode or footage values. Additionally, a double zero key is provided to speed up entry of footage and timecode values. EditCalc for the iPhone and iPod touch is available now for purchase through the iTunes App Store for 99¢. When you are on the go, and you bring so many USB bus Powered gadgets with you. How you can make all of them recharged? Probably you will not plug them all into your PC USB Sockets? Even so, you may not have enough port because 1 or 2 will be occupied by Keyboard and mouse. This Wall A/C Travel Charger has altogether 5 channels (USB A Female + 1 Mini USB 5 pin male) for you to charge FIVE devices at the same time. You can now create special effects with your mobile phone / compact digital camera. The 6 image lens will fit most standard phone cameras. However, if you phone camera has a large aperture lens or if the area around the aperture lens has an uneven surface, the 6-image lens may NOT be suitable for. Please check your phone camera prior to purchase. to be shipped on/before 27 Feb 2009. Tristan Zimmermann's amazing Phonofone has been released in a limited run of 200 pieces available in innocent white, or, if you prefer the darker side, black. Tristan Zimmermann invented the Phonofone, which is like a speaker for your iPod, only it uses no power. Through passive amplification alone, these unique pieces instantly transform any personal music player + earbuds into a sculptural audio console. Without the use of external power or batteries, the Phonofone II inventively exploits the virtues of horn acoustics to boost the audio output of standard earphones to up to 55 decibels. Now let's make this clear, 55 decibels is not going to entertain your party, but it's fine for the office or next to the bed or or for a dinner party. But honestly, if you want to get a great sounding set of speakers that you can crank up and rock out to, get a set of Bose. MP3 player - The output power of full size Apple brand iPods and iPod minis (HD size non specific) is ideally suited for powering a Phonofone. iPod nanos and shuffles are only recommended if used with an inline headphone amplifier (see point #5). It is also recommended to override your iPod volume restriction settings before hooking it up to a Phonofone. Headphones - Only Apple Brand earbuds (with the adapters provided with your Phonofone) are recommended for this application. Be aware that after prolonged use at loud volumes, the earbuds can start to degrade in audio quality. Types of music - The Phonofone is excellent for amplifying Blues, Classical and Folk music, but is less ideal for Electronic music and Rock. This is because the heavy bass associated with both Rock and Techno can result in clipping (buzzing) when played at its loudest volume. If clipping is occurring in a song, it can be overridden by selecting the 'bass reduction' equalizer setting in your iPod or by playing the song at a slightly lower volume. MP3 Quality - Not all music is mastered the same. That is, the baseline volume of each song can differ from each other significantly especially if your music library consist of illegally downloaded material (which we hope it isn't). If you are experiencing a large degree of variation in the listening volume of your MP3s try adjusting the gain (volume) of each file accordingly by using free 3rd party software. We will not assume responsibility for any damages that this software might incur. Headphone Preamplifiers - If you plan on using your Phonofone with an iPod shuffle or nano, or are simply seeking more volume from this device, you can purchase a headphone amplifier. A headphone amplifier is small battery operated device that is placed inline between your MP3 player and your earbuds. This device will increase the power of the signal to the headphones which will result in a higher volume (and actually makes the Phonofone sound rather loud). Please note that using a preamplifier can significantly limit the life of your earbuds and should be used with discretion. If you hear the earbuds 'crackling' then it's time to turn the volume down. PR: These days budgets are tight and saving money is more important than ever. After spending hundreds of dollars on an expensive iPhone, smartphone, iPod or PDA, how can you afford not to protect it from damage or destruction? OtterBox offers a full line of cases to add protection and longevity to today's hottest tech devices. Apple Devices: Take your favorite Apple device on any adventure with new cases for the iPhone 3G, iPod touch 2nd generation and iPod nano 4th generation. Silicone skin-style Impact Series* cases and drop and scratchproof Defender Series** cases are available for all three devices. 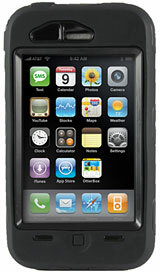 Fully waterproof Armor Series*** cases are available for the iPod touch and coming soon for the iPod nano 4th generation. HP iPAQ Devices: Innovative Defender Series cases are now available for the HP iPAQ 110 and 210 PDAs (for standard and extended battery models) and the HP iPAQ 600 Series smartphone. Take your business on-the-go and safeguard from your hectic lifestyle. Cases protect against dust, dirt, drops and scratches. BlackBerry Smartphones: New Defender Series cases for the BlackBerry Curve 8350i, BlackBerry 8700 Series, BlackBerry Bold and BlackBerry Storm offer users a wide variety of options for their device of choice. These semi-rugged, fully interactive cases protect against life's extremes. Also available for the BlackBerry Bold is the new Impact Series case. Not your average skin, the OtterBox Impact series provides inner coring for added protection against bump and shock. Palm Devices: Introducing the first Defender Series cases for Palm devices, these cases provide trusted OtterBox protection without adding bulk to the Centro and Treo 800w. Make phone calls, check your email and surf the net with ease. All device features are accessible through the case. With innovative cases from OtterBox, you can feel secure taking your Centro or Treo device anywhere. A damaged device can lead to lost music, data and contacts, and cost hundreds of dollars to repair or replace. OtterBox protects expensive devices, saving you time and money. *Impact Series case NOT protected against water. Will provide some added protection against bump and shock. **Defender Series case does NOT protect against water. Will provide some added protection against drop, bump and dust. 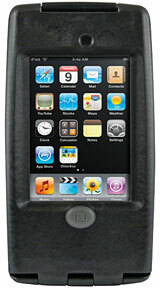 ***Armor Series cases are NOT adapted to withstand pressures experienced by scuba diving. Using the incorrect case may cause leakage. OtterBox is not responsible for personal property when used in the incorrect case. For more details, please see warranty.